There were problems with the releasing of this album. Somebody took note about the little spelling error on the sleeve, and the whole band persisted until it was corrected. When the album was finished, petroleum crisis came, with after-effects in all country - government accepted precautions about energy saving, which delayed the releasing again. 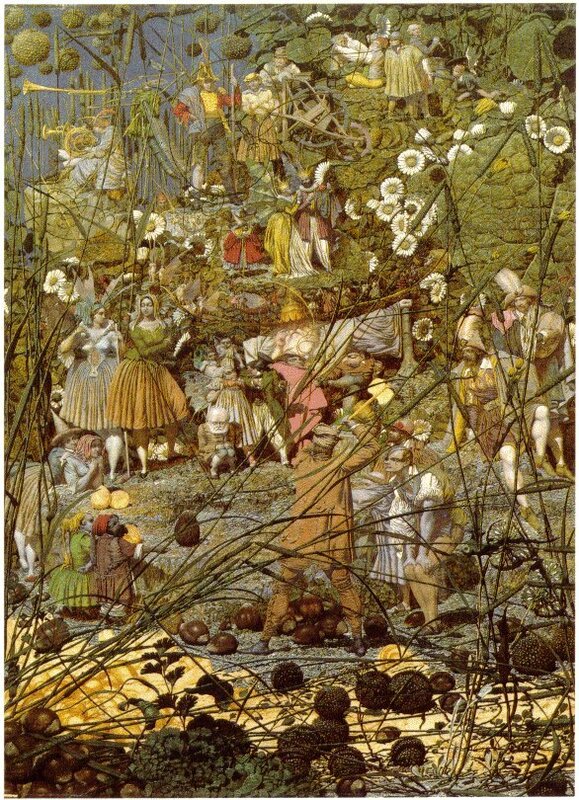 This Victorian painting by a little known English artist Richard Dadd Freddie used for the inspiration to record 'Fairy Fellers Masterstroke' song. "For some strange reason we seemed to get a rather different feel on the album because of the way we were forced to record it, and even allowing for the problems we had none of us were really displeased with the result." "Led Zeppelin and The Who are probably in there somewhere because they were among our favorite groups., but what we are trying to do differently from either of those groups was this sort of layered sound. The Who had the open chord guitar sound, and there's a bit of that in 'Father To Son', but our sound is more based on the over driven guitar sound, which is used for the main bulk of the song, but I also wanted to build up textures behind the main melody lines To me, 'Queen II' was the sort of emotional music we'd always wanted to be able to play, although we couldn't play most of it on Stage because it was too Complicated. We were trying to push studio techniques to a new limit for rock groups - it was full filling all our dreams because we didn't have much opportunity for that on the first album. It went through our minds to call the album 'Over The Top'." "We took so much trouble over that album possibly too much but when we finished we felt really proud. Immediately it got really bad reviews, so I took it home to listen to and thought Christ, are they right? But after hearing it a few weeks later I still like it. I think it's great. We'll stick by it." "Considering the abuse we've had lately I'm surprised that the new LP has done so well. I suppose it's basically because people like the band." "Freddie also wrote 'Ogre Battle' which is a very heavy metal guitar riff. It's strange that he should have done that. But when Freddie used to pick up a guitar he'd have a great frenetic energy. It was kind of like a very nervy animal playing the guitar. He was a very impatient person and was very impatient with his own technique. He didn't have a great technical ability on the guitar but had it in his head. And you could feel this stuff bursting to get out. He right hand would move incredibly fast. He wrote a lot of good stuff for the guitar. A lot of it was stuff which I would not have thought of, because it would be in weird keys. He had this penchant for playing in E flat and A flat and F. And these are not places that your hand naturally falls on when playing the guitar"
"Well... that was a concept that we develop in that time was... it doesn't have, any special meaning. But we were fascinated with this type of things... the wardrobe that we used at the time described it perfectly well..."
"This song has remained a mystery to me over the years, too. It is based on an old blues number. When I tried to find out the original writer at the time, and again a few years later, I drew a blank. My recollection is that I heard it on a TV show performed, I think, by Muddy Waters. For the Queen session, I just remembered what I could and made up the rest, especially most of the words." New Musical Express: The album is deonstration of their power and vim, of their authorship talent and all of the advantages, which makes them unique. Sounds: This album with simple name 'Queen II' entraps them in their bright time. Disc: material, presentation, technical side and art impression are on high level. Record Mirror : That's it, reverse face of fascinating rock. If this poor and over-prodicting band is our future, we are falling into rock'n'roll suicide without control. The B-side to "Seven Seas Of Rhye", on 7" and CD3. Also on the US CD remaster of "Queen II". Brian's blues 4:32 long song with many interludes. Rumours says that it is sort of cover version, or copy of something, but he's credited as writer. Many blues songs are similar, because of similarity of blues. Different to normal version, some of the Freddie's vocals were a bit subdued, and the whole song sounds simpler. Sometimes is called as a demo, but not officially. Seems slightly different, specially in the first chorus.. Features extra piano from Freddie, it's very close to the great live versions. There is home demo, done by Smile. It looks to be very rough take and different to the Queen version. By Nicholas Sansano. Bonus track on the US "Queen II" CD remaster with some extra guitar, but it seems no to be Brian's Special. On the "Digital Master Sampler" CD. This version is 25 sec. shorter special edit (without last 30 sec. of intro to the 'March Of The Black Queen' - ends on the very last "Ahh"s before the guitar goes on). Japan version from 1988 with the "Ahh"s edited out completely. 1:23 long version features drums and guitars. This album contains first real hit (Seven Seas Of Rhye) and other great master-pieces like great album intro 'Procession', nice lovesong Nevermore (close and leaved to the 'Love Of My Life'). This album came to my taste in the other days too. I love Wonderfull work like 'Father To Son', 'White Queen', 'The Fairy Fellers Masterstroke' and 'The March Of The Black Queen'. This album may sound very difficult to non-queen listeners.